Admission is free and open to USC students only. Line up and get a wristband at the event check-in on Trousdale Parkway in front of Bovard Auditorium. Wristbands, shirts, and bags will be distributed on a first-come, first-served basis. Doors open at 7:15 p.m. Arrive early! Kick off the 2018–19 academic year and the 13th season of Visions and Voices at SPARK!, featuring the socially engaged dance and poetry of Love Heals All Wounds. The evening will open with an electrifying spoken word performance by two-time National Poetry Slam Champion Javon Johnson. 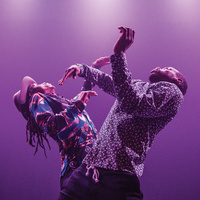 Then, dancer/choreographers Lil Buck and Jon Boogz—together known as MAI (Movement Art Is)—will take you on a journey to explore our shared consciousness around issues such as climate change, mass incarceration, and immigration through popping, jookin, and spoken word by Robin Sanders. Love Heals All Wounds employs street dance and political theatre to shed light on the challenges we face as a global community while inspiring us to create change. After the show, stick around for a dance party and reception featuring DJs Urban Assault (aka Faust and Shortee). The event will also include a welcome by Provost Michael Quick. Plus, attendees will receive free Visions and Voices T-shirts and bags. Robin Sanders is a performing artist, educator, and the founder and director of Out Loud Artistry (OLA), a performing-arts training and mentorship program. Her spoken-word works include An Ode to Hip Hop and See What I’m Saying. Presented by USC Visions and Voices: The Arts and Humanities Initiative. Co-sponsored by USC Residential Education. Admission is free and open to USC students only. Line up and get a wristband at the event check-in on Trousdale Parkway in front of Bovard Auditorium. Wristbands, shirts and bags will be distributed on a first-come, first-served basis. Doors open at 7:15 p.m. Arrive early!